Granda, a Spanish liturgical arts workshop and a vestment atelier, recently accepted commission to make a chasuble based on a sixteenth century antique. 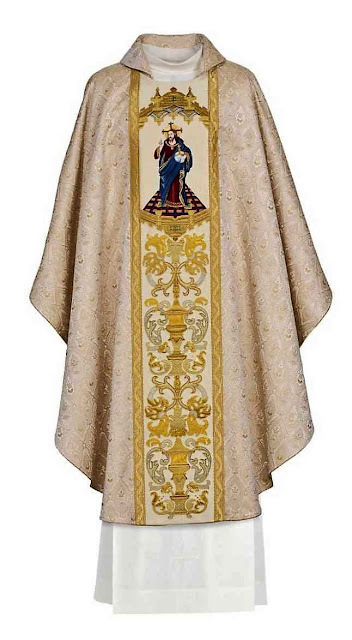 A red fabric fragment together with the embroidered images of Salvator Mundi and Our Lady with Child served as an inspiration for the new vestment. Since the original embroidery was very fragile, the solution was to replicate the original images as closely as possible and apply them to a new silk setting. Salvator Mundi Chasuble: hand embroidery and applique on red textile. 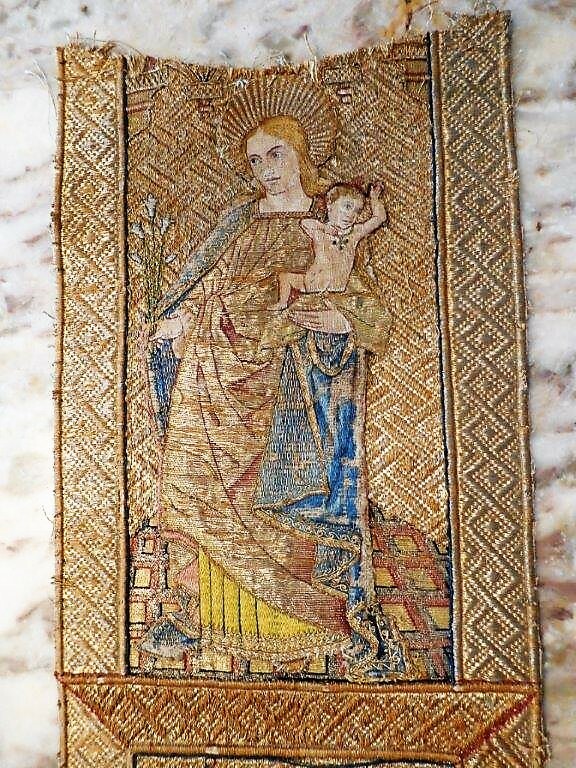 Intense pairing of images, in the manner of Salvator Mundi with Our Lady and Child image on one chasuble, is a design concept characteristic of the early Renaissance period, which tended to extol the Redeemer's humanity, both in its beauty and in its fragility. Nonetheless, it must also be noted that a strong drive to find ever more stimulating combinations of theological insight with an ever more refined aesthetic expression has always been part and parcel of best artworks in the Christian heritage since the Antiquity. Eschatologically charged portraits of Christ with the right hand raised in blessing and the left hand cradling a globe surmounted by a cross originated in the North of Europe, possibly in the Netherlands, where they surfaced in the fifteenth century. This striking portrait image of the Redeemer was first used in painting and then traversed into embroidery, tapestry, and vesture. Once it migrated to the south of Europe, it became especially fashionable in Spain. The style of images seen on the new chasuble combines late Gothic and early Renaissance features. Elegant postures of figures presented in an architectural setting are a Renaissance development often associated with the Spanish embroideries of that period. A fully attired figure of Risen Christ is more typical of the earlier medieval usage. 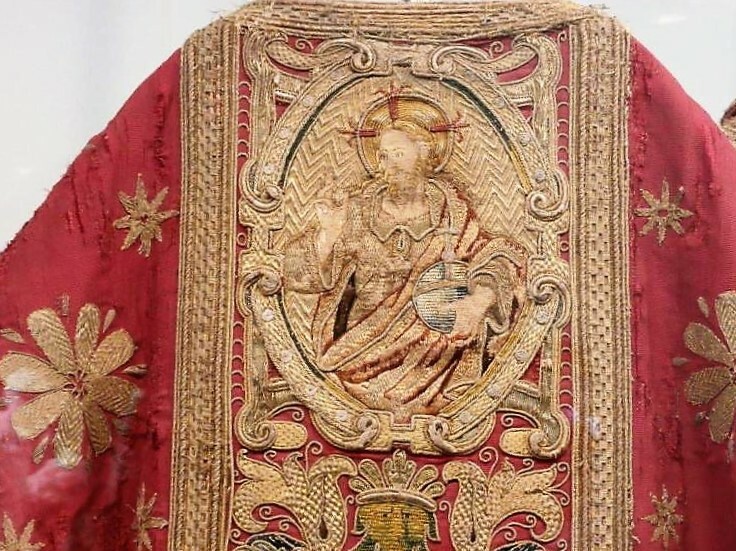 The red fabric used on the original chasuble is also associated with the Spanish artistic practice. In the photo you can see that the red is subdued, almost rose since it has faded over time, but it would have been vivid when originally made. 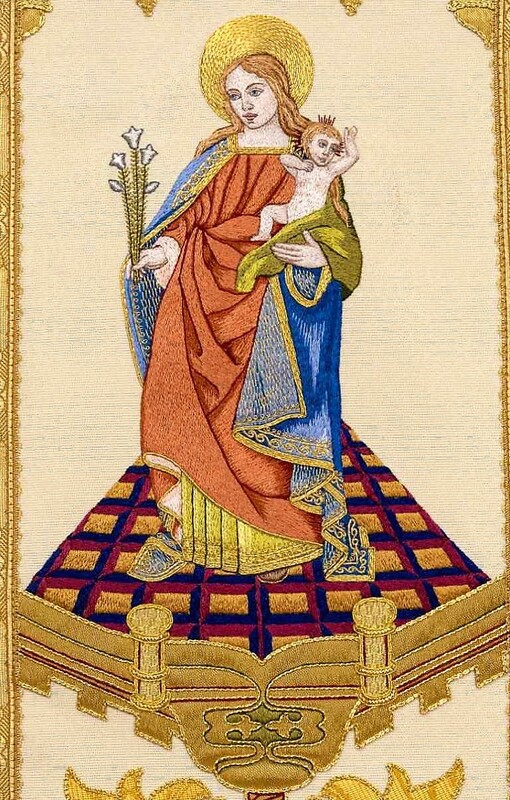 Red was considered one of the most precious and lavish kinds of textiles woven in the fifteenth and sixteenth centuries and therefore especially fitting for use in the vestis sacra projects. 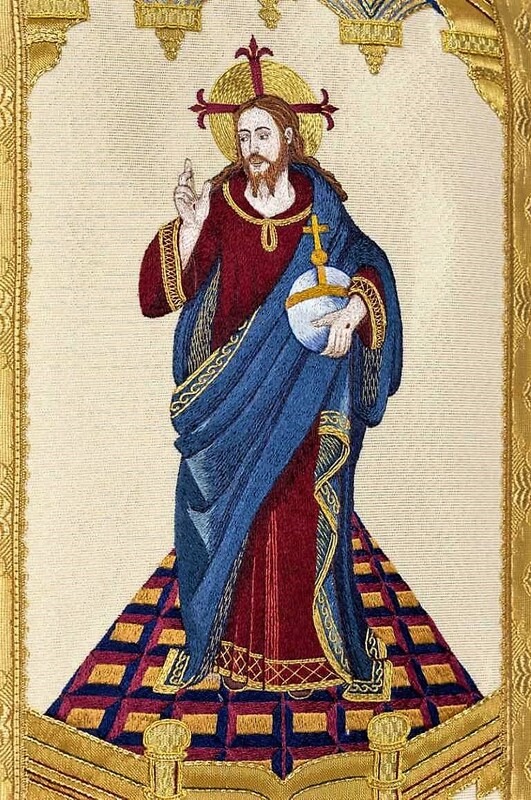 Granda’s vestment atelier - Los Rosales - used two different techniques to create a new Salvator Mundi chasuble: needle painting for the images and hand applique for the decorative detailing on the central panel. The fabric of the body is a white-gold brocade silk. Gold trims and embroidery were used to frame the panels. The cut is full Gothic with half collar.